There’s Something Behind the Glass | Words. On the Internet. Why doesn’t the tapping stop? Today I would like to write a brief, but slightly more unique, review of Diabolic Game’s latest release, Behind the Glass. Right off the bat, I have to say that it’s been one of the best horror games I’ve played in recent memory. From its incredibly high-resolution textures and animations, to its terrifying atmosphere, down to simply gameplay itself, Behind the Glass is absolutely phenomenal. Yet, what truly makes the game excel is not the aforementioned, but its revolutionary use of vivid and subtle Easter eggs and psychological manipulation. It is quite simply unlike anything I’ve experienced in a game before. Graphically, Behind the Glass is mind-blowing, and I don’t use that term lightly. It’s visually the best game I’ve seen in years, even surpassing my jaded memories of sitting on my concrete basement floor and playing Mario 64 for the first time. It’s easily better than anything on the market today, especially the oft-compared Battlefield 4. To say it is lifelike is almost an understatement. That said, I don’t feel the need to expand on this. You can view screenshots, you can see the videos. The textures and animations are as phenomenal as they were at E3, believe it or not. In terms of gameplay, Behind the Glass is simply addicting. I sat down initially to play for maybe an hour or two, but ended up going strong for almost six straight. I can’t say exactly what it is that kept me going, though. Admittedly, the story is a bit flat. You play as Ashley, the perpetually-terrified protagonist trying to escape the clutches of a haunted home. It’s a played out scenario, almost akin to Outlast—save for not being in a mental hospital and with significantly fewer corpses. Yet the atmosphere keeps the game enthralling, keeps you glued to your screen. While you know how the game will probably end and you tell yourself that nothing is going to jump out of the monitor and grab you, the feeling remains that something is watching you, like there’s somebody waiting for you to turn around. And that is all due to the subtle Easter eggs scattered throughout the game, enhancing it and making it all the more real. At first I was a bit perturbed by the Easter eggs—if that’s even the right term for a genre like this. They broke the fourth wall for me, took me out of the game. The initial one I came across was a simple clown’s face staring at me from the basement of the first level, presumably a reference to something that I haven’t yet figured out. It just watched me, as if it were some sort of a reflection, fading in and out of the darkness as I moved my neck forward and back. I thought it was a little clichéd at first, almost a bit stupid, but it grew on me. The more I noticed how its eyes seemed to follow my own, watching both me and the character walk past its faded, shadowed face, I found myself becoming more and more nervous. I had to stop playing once or twice just to make sure I was still alone. It is truly a terrifying addition, although I don’t quite understand the reference. I assume it is from one of Diabolic’s previous games, but I couldn’t find any information about it. Whatever the case, the clown is somewhat of a recurring character. Yes, it’s subtle, but you reencounter him every now and then as you move through the game. It’s always like he’s staring at you from just behind the monitor, as if he was camped out in its circuits, watching you as you play. You can’t quite make out the details of his face, but you can see how the white paint drips down from his forehead and mixes with his ruby-painted mouth, swirling together like blood on a wet canvas. His oblong, black eyes are always the clearest part of him, always locked on you as you play. I don’t know how the developers did it, but it just gets more and more life-like as Ashley progresses through the house. At first he’s simply a face in the shadows, yet he becomes more vivid as the game goes on and the scenes become darker. You can clearly see him watching you, as if he’s real. I began to think at about the midway point of the game that he was the antagonist, the person responsible for Ashley’s kidnapping. Yet everything I read online, they all claim the antagonist isn’t encountered until later in the game. No one seems to have even noticed the clown yet. One of the most fascinating Easter eggs in Behind the Glass (I don’t even know if you can call it an Easter egg, again), is a subtle tap that follows you through the levels. It’s like someone hitting a piece of glass with a penny, or a knife, or a sharpened finger nail, lightly poking it in evenly spaced beats. Just an incredibly lifelike “tap, tap, tap, tap” here and there. The first time I heard it, in fact, I had to get off the computer and turn on the lights just to check. I thought there might have been someone outside my window, but there was nothing out there other than the reflection of my own face in my well-lit room. It was clearly the game, nothing more than a bit of psychological torment. I know that isn’t technically an Easter egg, but it’s amazing how real it sounds, how much it enhances the gameplay. In short, I want to give Behind the Glass a 10 out of 10. Not just because it has such enticing gameplay, or for its incredibly life-like graphics, but more so due to the developer’s attention to detail and their phenomenal use of psychological thrills and subtle Easter eggs. Even as I write this, and despite the game being minimized, I can still hear the tapping. 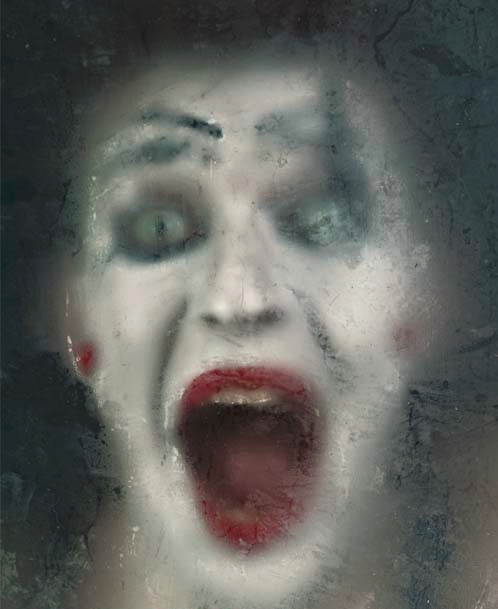 In fact, somehow, the developers have made it so I can still see the clown’s paint-stained face on my screen, its faded black eyes staring at me as if it were nothing more than a reflection on my monitor. Now I just need to figure out how to make the tapping stop.